The body, our best canvas for art and expression. I’ve had more hair cuts and colors and styles than I can count, I’m also quite decorated in permanent body art, tattoos. I love clothes, I love make-up, I basically love expressing myself with this physical form of mine. One of the main reasons I didn’t follow my old dream of being a film actress? I realized I would have had to look mainstream and BORING for the rest of my life. No thank you! But, of course, many of these decorative techniques we use in this culture are, sadly, toxic. Hair care and make-up are not well regulated. (here’s a guide to finding safe brands) Hair dye is known to be full of problematic chemicals (yes, even the “natural” ones). So my crunchy hippie side often has wrestling matches with my fabulous femme side over just how to decorate myself. The hippie side has, for the most part, won by little bits over the years. But my inner femme will never totally let go. I used to be really good about being super body-positive, not buying into consumerist gendered marketing, and not putting toxic crap on myself. Then around decade ago I totally fell off the wagon. Something about living in SoCal again and being in fashion school totally brainwashed me for awhile and my hippie and some of my punk side flew out the window. I wore high heels every day, and wore skin tight trendy clothes at all times. My hair was dyed and flat ironed, and my make-up was harsh blacks and bright neons. I didn’t care how toxic anything was, I just slathered myself in it. But when I got really sick a few years ago a huge change occurred. It triggered my inner earth mamma again, suddenly I was pulled down and grounded, realizing I needed to wear the comfy shoes and non-restrictive clothing for my health. And suddenly being a trendy fashionista was not a top priority. Now I’ve settled in between the two – A sort of hippie goth thing has happened. I decorate myself, but try to do it healthfully. 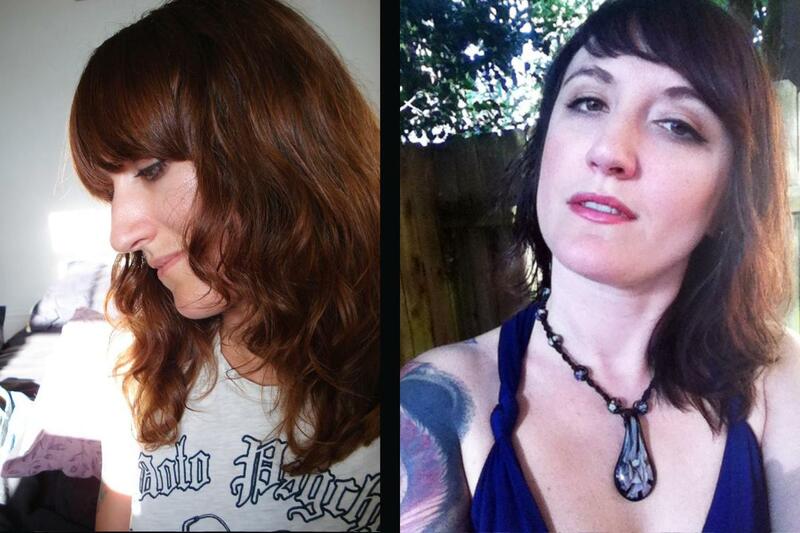 I’ve researched non-toxic, animal friendly make-ups, etc… And I’ve done really well with it, except the hair dye thing. I had a period during my recent uber-crunchy phase where I had totally natural, un-dyed hair… something I hadn’t had since being a young teenager. Then I got bored with it, as I always do, and decided I’d color it with henna to be healthy AND have fun. But eventually, I got tired of the mellow colors of henna and fell off the wagon again, going back to dying it bright red and dark browns. I really have noticed a big difference in my hair’s texture and body since doing this. As you can see in this picture, the hennaed hair, on the right, is shiny and thick and wavy, and the hair on the right, which has been dyed for 3 years now, is kinda fuzzy and flat. BUT, can I overcome my love of dark hair to go back to henna? I think I just might. I’m going to eventually go for a brighter red than the color in the pic, which was a brown henna. I’m also going to get a heated hair cap, which, apparently, makes henna more vibrant. Now, if you yourself are looking to switch to henna hair dye, be very very picky about which brand you choose. There are henna dyes out there that are just as toxic as conventional hair dye. Make sure it is PURE, fresh henna. Here’s a quick FAQ on henna. I’m personally a fan of Avigal Henna, and Lush Cosmetics Henna, but there are other quality brands out there. Basically, if it uses any weird ingredients, don’t buy it. READ LOTS about henna before you use it- otherwise you may end-up with no results, a frustrating, messy time, and sometimes even green hair. Henna is, absolutely, a bit more of an undertaking than conventional hair dye. It’s a natural product, so it’s gritty, clumpy, crumbly, and takes longer to process. But it makes your hair look and feel AMAZING. So it’s totally worth it. Things I personally like to add to my henna mix: I use hot coffee instead of water, and add red wine for a redder shade. A couple tablespoons of olive oil is also a good call if you’re using a powdered henna. Also, I’m going totally henna crazy and am going to learn to do henna tattoos as well. I’ve been madly in love with the traditional designs of it for years, and would love to set-up a little booth with draped fabric and pillows at festivals and decorate people with it. So I’ll be using lots of my friends as guinea pigs and will photograph the results. In a few months I’ll also post a hair update to see how things are going with the henna transition. So far, the first application went great, but my roots are lighter than the rest of my hair, which is not ideal. It was immediately so much thicker though, and made my scalp really happy. Have you hennaed your hair? Have any thoughts or tips? Please post them below! Hey Cypress, I’m back again ! I hereby award you the Versatile Blogger Award !